We have been talking about getting a bird feeder for humming birds! 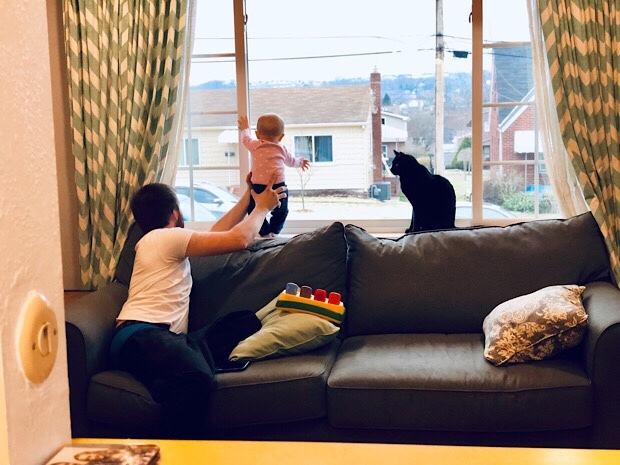 I hope you get one, dad! 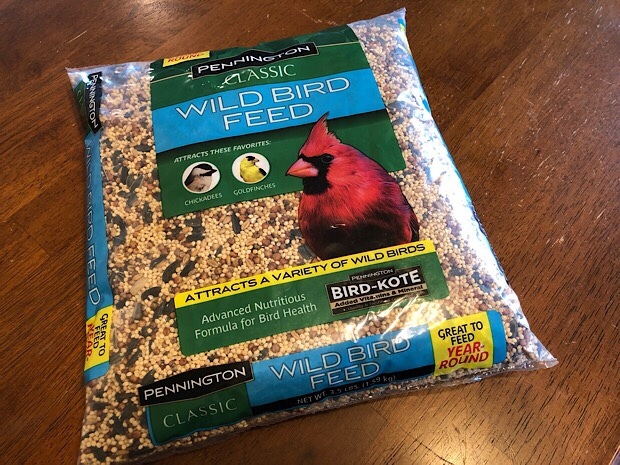 It’s so fun to see the birds come and feed! Love you! 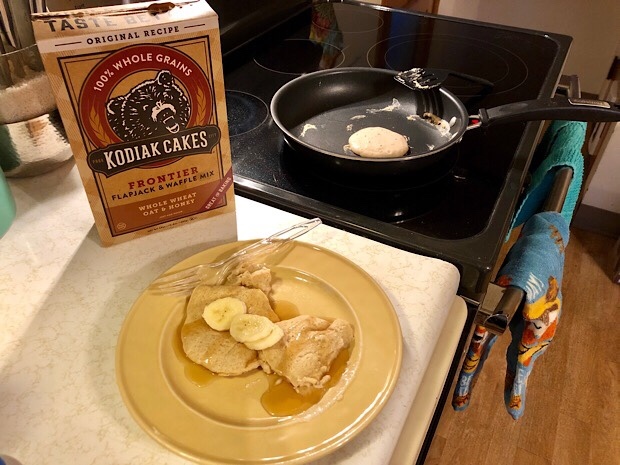 We are HUGE fans of Kodiak Cakes here in this family!! I love that we enjoy them just like that… or we can throw in blueberries, mashed banana… or even a handful of chocolate chips. 😉 So yummy!! And I always feel so energized afterward. You totally gave me the idea to add mashed banana into Kodak cakes! I tried it this week and can I just say thank you?! So delicious! I’m SO glad you tried the mashed banana in the Kodiak cakes and liked it!!! Aren’t banana pancakes the best?!? I love your goal of washing and vacuuming out the cars monthly! Just this past weekend, we washed & vacuumed our car and it feels so nice to have it done! I think I tend to underestimate how great it is to have a clean car, inside and out. Also, Sadie is adorable in that shirt!! It’s a lofty goal for me, but who knows, maybe I can get it done! Like you said, it’s a good feeling to have the car all clean! Thanks for the compliment on Sadie in her shirt!! Also, I’ve heard others mention Kodiak cakes, but I have to know, what’s so different about them? Are they a mix like Bisquick? Yeah, they’re similar to Bisquick in that you just add water and/or oil if you’re making pancakes or waffles! What’s different is that they’re considered healthier because they use whole grains, some mixes have extra protein, and they don’t use artificial ingredients! We love Kodiak pancakes!! We also use them to make “cake-in-a-mug” (1/4 cup mix, 1/4 cup milk of choice, small handful of mix-ins, microwave 1 minute, enjoy) and muffins (https://www.ahealthysliceoflife.com/recipe-pancake-muffins-for-kids/). I just made a batch of the muffins this week! How is Sadie old enough for us to be talking about Baby Led Weaning and food?! Isn’t she just a newborn. Ah, big kid. These pictures of her are amazing me. She is growing so fast! Okay, thank you so much for that little recipe idea!! I need to try it ASAP! I love how simple it is! I literally have no clue how Sadie is into baby led weaning already… like how?! It’s wild! Thank you SO much for your email! It was a huge help! I’m going to reply sometime today if Sadie allows, haha! Oh she’s so cute with her tool belt!! Ready to start welding with Dad in the shop. I have heard good things about Kodiak cakes. The oats and honey flavor you mentioned sounds really good. I couldn’t resist the little T-shirt! Even if it was $10 and she’ll outgrow it way too fast, haha. I kept hearing all about Kodak cakes and finally gave them a try. I’d definitely recommend them! They’re easy to make and I feel good about the ingredients! 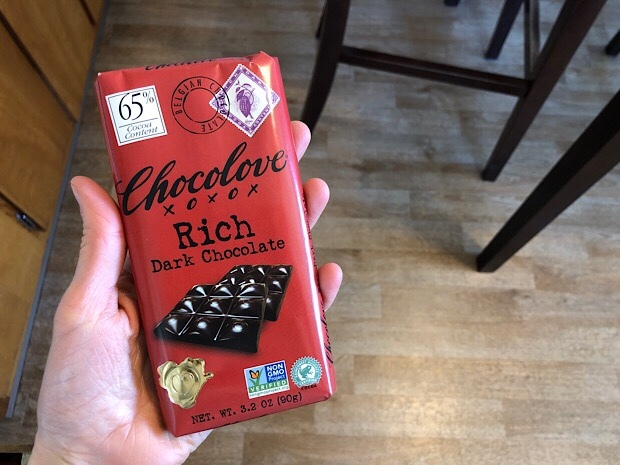 Dark chocolate is so good! There’s just something about that deep, dark flavor! 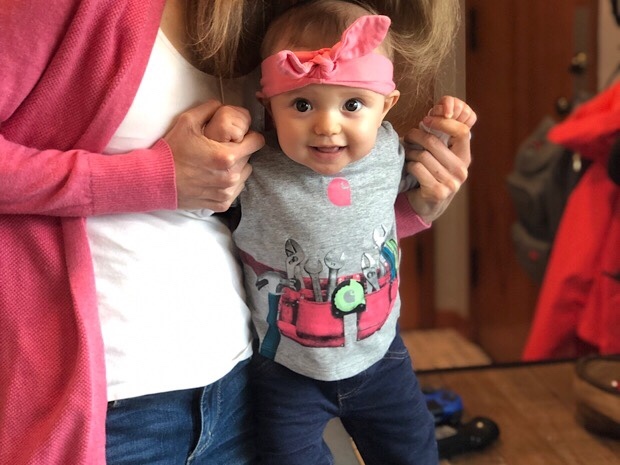 Thanks for the compliment about Sadie in her lil T-shirt!